I have been waiting to share this quilt with you for months...8 months to be exact! When editing my photos for this post last night, I noted the datestamp on my quilt photo was August 6, 2012. I can't believe it's been that long! I remember bringing my fabric and sewing machine on summer vacation last year, working to finish this quilt up. Last Spring, Fons & Porter asked if I was interested in designing a quilt for a future issue, similar to the "style" of my Cutting Edge quilt which had been displayed at Spring Quilt Market. Well, that was a no brainer for me - of course I would! I was lucky enough to work again with the wonderful designer solids by Free Spirit. Well, all these months later, I am excited to share with you that my quilt is in the now-available May/June 2013 issue of Fons & Porter's Love of Quilting. 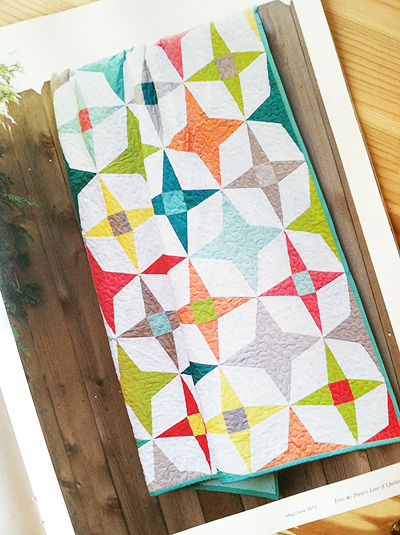 You can even buy a kit of my quilt, how cool is that! This quilt measures 60" x 72" and the stars are all paper pieced for perfect accuracy. I quilted mine with a nice meandering design all over. I just love the solids and stars, the colors...I can't wait to get it back in the mail! Fabrics used in this quilt: Free Spirit Designer Solids in Lemon, Peach Blush, Chartreuse, Caribbean Sea, Light Jade, Jade, Sand Dune, Dogwood, Dark Coral, Flamingo, Winter White. I thought it would be fun to share with you my original mock up for the quilt when I was in the design phase. (I do most of my design work in Photoshop). I think the finished quilt is pretty close to the mockup. Visitors just have to pay $5, so I hope you will stop by!